The Packers, “Essex’s most lovable yet totally dysfunctional family,” take to the stage in Clive Exton’s new “MUST-SEE” comedy, Barking in Essex which runs at the Wyndham’s Theatre from September 2013 – January 2014. The story begins as dim-witted family member, Algie, is finally set to be released from prison having served a seven year jail sentence. News of his return sends the packer family into a frenzy and it becomes clear that this not so wholesome troupe has something to hide! On Algie’s eventual release, he goes in search of the 3.5 million pounds in bank notes he has stashed away at his family home, only to discover there is something more peculiar than usual about the Packers. Noting his families seeming upturn in fortunes, Algie starts to suspecting that the “well dodgy” Packer brood may have something to do with the disappearance of the cash. 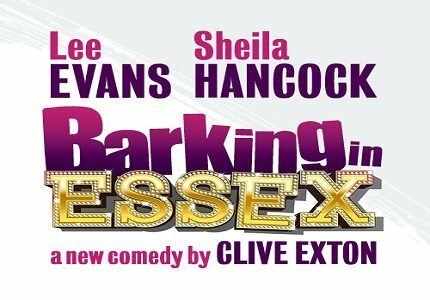 Barking in Essex stars the award-winning actress Sheila Hancock as the lean mean Emmie Packer, funny man Lee Evans as Darnley Packer, Keeley Hawes as the ditzy essex babe, Chrissie Packer. Karl Johnson appears as the gangster Rocco and Montserrat Lombard features as Allegra Tennyson. Harry Burton directs the production, with Simon Higlett providing the set design. TOWIE fans will love this gaudy production that his all the class of a cheap glass of plonk but all the hilarity of a rip-roaring comedy show. This production is absolutely 100 per cent not suitable for young children due to the amount of foul language on display. There are also some adult themes that are not suitable for children. Teenagers of 16+ may enjoy the show if accompanied by an adult.